The NanaWall PrivaSEE is a frameless, operable all glass wall system that provides better sound buffering than most fixed, glass partitions. The fact that we are able to achieve such a high sound rating without a floor track makes PrivaSEE all the more incredible. 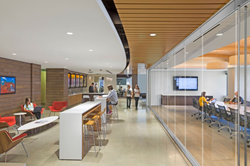 NanaWall Systems introduces the patent-pending NanaWall PrivaSEE™—a frameless, operable all glass wall system that provides better sound buffering than most fixed glass partitions. With no floor track, PrivaSEE is the industry’s only all glass single track sliding system specifically engineered for enhanced acoustical separation, allowing architects and designers to control sound transparently. Most conference room specifications call for an STC of 35 and acoustic engineers have had to rely on a fixed glass partition in order to achieve this rating. Now, with PrivaSEE, a moveable glass wall is able to accomplish an even higher sound rating of STC 36, yet provides the flexibility to completely open. PrivaSEE leads the opening glass wall industry into a new realm of unprecedented sound control by offering audible privacy for commercial applications where noise often serves as a distraction. It provides a highly flexible division of space that allows for uninterrupted transitions and visual transparency between interior spaces. PrivaSEE offers commercial design layouts—such as offices, banks, and schools—the ability to create large, open areas while still providing intimacy for private conversations. •Transparent Vertical Acoustical Seals: These clear edge seals virtually disappear from sight and provide enhanced acoustical separation between panels. The light transmittance (LT) of the sound seals are rated for 75% clarity and luminosity. •Self-activated Interlock and Compression Seals: Compression seals and panel interlock happens automatically when the panels shut, eliminating the need to kneel and lock manually. For more information about PrivaSEE or other NanaWall Systems products, please visit nanawall.com. Celebrating its 30th anniversary, NanaWall Systems redefined the category of opening glass wall systems. During its 30-plus years in business, the company has earned the trust of architects, builders, design professionals and homeowners as a custom solution for re-imagining how buildings, people and the elements interact. By combining precision engineering and outstanding design options throughout more than 25 unique award-winning systems, NanaWall Systems advances design possibilities beyond the conventional for almost any space. NanaWall Systems is headquartered in the San Francisco Bay Area, with 23 showroom and design studio locations across North America.